A spiced sipper to serve at the end of a dinner party. Some nights, a soothing cup of chamomile is exactly what we want to sip on before slipping into bed. 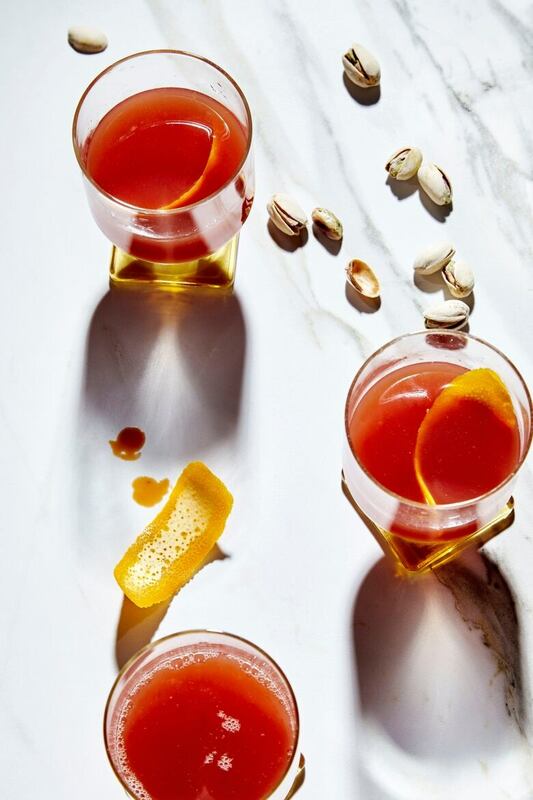 On other occasions, we seek something a little more complex, like this citrusy concoction from Kara Newman’s new book Nightcap. Made with orange juice, a splash of red wine and chai-infused vermouth, it’s built for those who prefer cocktails that are lighter on the alcohol, but still boast a rich flavour palette. Serve as a calming finale at your next dinner party. A group of Atlanta Bartenders created the easy-on-the-alcohol “suppressor” category, a gentler option compared to higher-octane “revivers.” This one, created by Lara Creasy for Decatur, Georgia, restaurant No. 246, is particularly fireside-ready, thanks to an infusion of calming chai tea. Pour vermouth into a small bowl. Immerse the chai tea bag in hot water for 10 seconds. Then remove it and immerse it in the vermouth. Allow to steep for 5 minutes. Remove the tea bag before proceeding. In a cocktail shaker, combine the infused vermouth, red wine, orange juice, honey syrup, and both bitters with ice. Shake well, and strain into a footed cocktail glass, such as a small snifter or red wineglass. Garnish with an orange peel. Stir two parts honey into one part hot water (no need for boiling water like in sugar syrups). It will take some stirring to get the honey to dissolve and incorporate. Excerpted from Nightcap by Kara Newman. Photographs by Antonis Achilleos. Copyright 2018. Excerpted with permission from the publisher, Chronicle Books. All rights reserved. No part of this excerpt may be reproduced or reprinted without permission in writing from the publisher.